The Harpenden Society held a public meeting on Thursday, October 24th to announce the NHS plan to redevelop the Red House also known as the Harpenden Memorial Hospital. The meeting was held in Park Hall, Harpenden. The hall was filled to capacity which reflected the interest in this project. David Law, chief executive of the Herts Community NHS Trust, assisted by Mark Carman, the project manager, presented the proposal for a new Health and Wellbeing Campus. The Harpenden campus will incorporate a range of facilities, including some residential, to deliver integrated health and social care, all in a welcoming and localised environment. The audience listened intently and appreciatively to this clear-cut and comprehensive proposal. Questions were probing but positive and were raised concisely and answered competently. Great enthusiasm was shown for the scheme. The meeting was arranged by The Harpenden Society and the Red House Forum, the ginger group which has campaigned for such a way forward as this, and the whole evening proved to be invigorating. The attendees were clearly highly appreciative. Once all the necessary approvals have been given construction of the new facility could start as early as 2016. 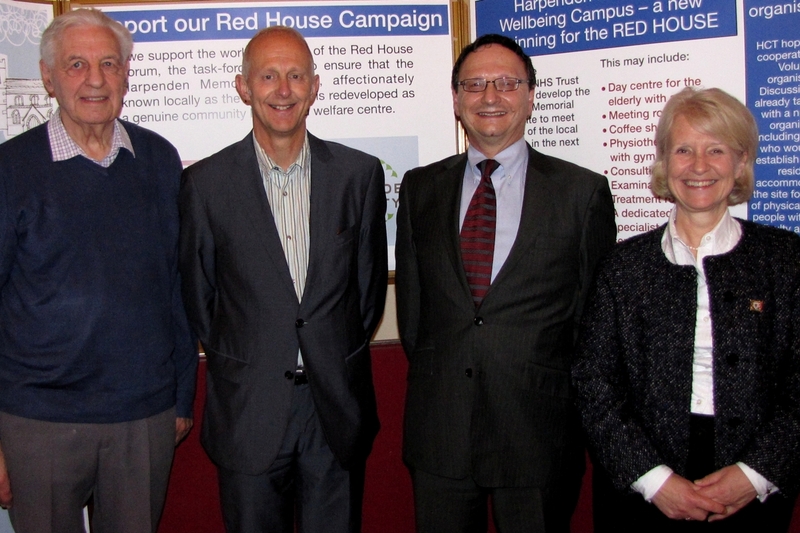 Left to right: Eric Midwinter - Co-organiser of the Red House Forum and member of The Harpenden Society, David Law - Chief Executive Herts Community NHS Trust, Mark Carman - NHS Project Manager and Teresa Heritage - County Councillor for Harpenden South West and Red House Forum co-organiser.